Asthma is a symptom caused by respiratory disorders in the form of heightened sensitivity to stimuli from the environment as a trigger. The trigger symptoms may include fatigue of the mind (emotional distress), physical fatigue, changes in the environment which is not expected (weather, humidity, temperature, smoke (especially tobacco) and smells stimulate), respiratory infections, especially of certain influenza illness, and allergic reaction of the material inhaled or eaten. Level of sensitivity of respiratory symptoms is initiated from mild symptoms (a runny nose / sneezing or coughing that often recurrent / relapsed) to severe symptoms of asthma attacks (difficulty breathing). This situation was characterized by a background of allergic reactions. The emergence of some degree of sensitivity of the recorded symptoms / can be expressed by the patient usually starts since childhood. 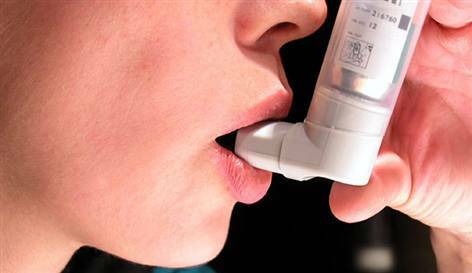 About 50% of symptoms will heal by itself, although at one time these symptoms will appear again at more severe levels of symptoms that are often given the term asthma. Approximately 55-6 -% in respiratory allergic diseases can be reduced to a child or grandchild and the rest is caused due to environmental pollution that are less or are not getting attention, because that new symptoms arise after today is not because it is a strange thing. - Dust is in the house of dustcomes from kapok mattresses ,carpets ,sofa ,old clothes stored in closets ,ceiling roof ,buku-buku/kertas the old archives ,etc. .
- Raw foods especially sea fish, cow's milk, eggs, chocolate, nuts, etc.. (foodstuffs that have traits that irritate include spicy, cold, sticky, sweet / sour, salty, etc.. not the cause but the trigger). - Environment including fur that comes from agricultural materials (pollen, hay, grasses, bagasse, etc..), materials originating from poultry droppings and feathers and pets.